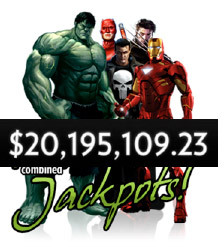 Right now Jackpots at Fly Casino are over a combined $20,000,000! Yes you are reading that right, there is over 20 Million Dollars to be won in our Jackpot specific games. The Marvel Slots Jackpot system to go along with huge Jackpots at WallStreet, Beach Life and Streak of Luck. These Jackpots are ready to Fly away so get in there and take a shot at them! On Sunday from 00:00GMT until 23:59 GMT, all members on their first deposit of $/£/€25 or more will receive a $/£/€60.00 deposit bonus.